Las Vegas Nv., March 10, 2014 – Nate Sevier threw a five hitter and notched three hits and an RBI as the Monterey Seals defeated the So Cal Snappers 5-3 to claim the 25 National Kickoff Title. It was the Seals first trip to the Kickoff. Eddie Abila’s sacrifice fly in the top of the ninth inning scored Maurice Lesley with what proved to be the winning run of the ballgame. Michael Corn, who boarded on an infield error with one out, scored the tying run of the game on a passed ball. JoJo Grewell stroked an RBI single to provide some insurance in the decisive three-run ninth. Sevier set down the Snappers in order in the bottom of the ninth recording his eighth and ninth strikeouts of the game for the final two outs. “We blew it,” said Snapper skipper Frank Sansone, in a frank assessment of the fateful ninth inning. He also tipped his hat to the Seals. “(Sevier) was quality. Hard throwing and hit his spots,” said Sansone. The win by the Seals soothed the chafing of a tournament opening 13-1 beat down by the Snappers in which the Seals committed several errors. Though the Seals appeared to cure their defensive woes after that opener, winning the next three games and playing more cohesive defense, it seemed they were in danger of suffering a fatal relapse as they yielded two unearned runs in the opening frame of the finals. While the hard-throwing Sevier got things under control, the Seals fought back against Snapper starter Reggie Rivard. Rick Miramontes singled, stole, and scored on the first of two singles by Eddie Abila to make it 2-1 Snappers after three innings. The Seals tied the game in the sixth inning when Sevier singled in Abila. Snapper slugger Mark Flatton boarded on a leadoff error in the eighth inning and later scored the go-ahead run on Manny Pimentel’s RBI single to set the stage for the thrilling ninth. It was a good day’s work for Sevier who in addition to getting the complete-game win in the finals, had a two-thirds inning save against the So Cal Titans in the semifinals. Zach Boyce earned the win in that game. Adam Perez, Arnoldo Gonzalez, Abila, and Miramontes all had two hits in the championship game win for the Seals. 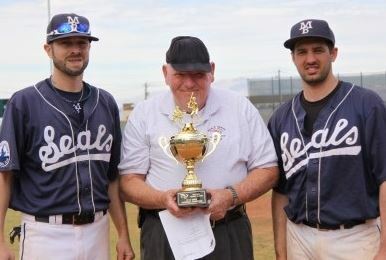 Aaron Love, Cris Trout, Jeremy VanderKaats, and Miramontes all pitched well for the Seals during the tournament, manager Jesse Moger said. Pimentel, batting in the three-hole, had two of the Snappers’ five hits and was the only snapper with multiple hits. The Snappers Andrew Alvarado struck out 14 in our pool game against the Palo Verde Reds in a 4-3 walk off win in the tournament’s second game.